It's another one of those secretive motorways. Yes, although it'll be a controversial one! Firstly, it's only 1.5 miles (2km) long. Surely it's just a bit of M90 then? Just after you exit the main route of the M90 at junction 2a, you come across what is called a "route confirmation" sign, that tells you the road number and distances to some of the places that can be reached along it. And? Stop dragging this out! Maybe so, but the facts are there! What's signposted in the other direction? The start of restrictions sign the other way says "M90". Before everyone jumps on the "it must then be part of M90" bandwagon, I'll remind everyone that both M45 and M10 were signposted as M1 for many years, as they led inescapably to the M1. The same thing applies here. How on earth did you find out about it then? An anonymous contributor disagrees with me! I still think, after reading everything, that it is an unnumbered spur of the M90, despite 'that' sign (you know the one). This is a common occurrence and other examples include a spur from the M1 towards Luton Airport, a spur from the M23 towards Gatwick Airport and a spur from the M11 to the A11 going towards Newmarket and Norwich. The last, I know, is signposted 'M11' from the A11, both on the 'start of motorway' sign and the route confirmation sign. 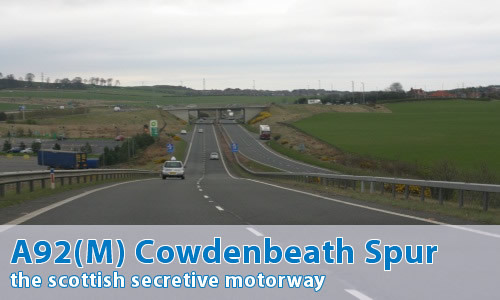 I have walked past this motorway, between the villages of Halbeath and Crossgates, a few times. The signposting does not establish that either A92 or M90 is the prevailing number, because they are both given equally as you describe. As the number A92(M) does not exist, I propose the correct number is A92(M90). It's a piece of the A92 under motorway regulations as a piece of the M90. M90 appears in brackets both to follow the A(M) sign pattern and because it's not part of the main through M90. Further up the M90 near Perth there is a pathetic junction where motorways meeting in 3 directions are all M90 but the shortest one is carefully signed as part of the main M90 and the 3 mile long spur to the west of Perth only as (M90), a unique numberless numbering. if you can have (M90) you can have A92(M90) I reckon. Good to see you got a picture of the weirdness that's going on there. I've been driving that section of road ever since it opened and it's the third incarnation of the sign. First sign was the same as now but had M90 on it. It mysteriously vanished and was replaced by a green primary A92 sign (which looked wrong as well as being wrong). Presumably someone complained and the A92 blue sign that's there now was put in its place. I'm wondering whether there should be a sign there at all - there's a route confirmation sign on the A92 proper after the onslips. Likewise for the M90 bound traffic - there's a route confirmation sign after the slip road finally merges. And so has Steve Mosby! Referring to this image, unless the person who is driving that car in front has passed a driving test, surely they shouldn't be on a motorway? Did you know that the BP petrol station that has a sign to the left of on one of the photos is abandoned and empty - its nearly as big as the Kinross Services site up the road on the M90 but it never managed to take of as its actually quite difficult to access. If someone wanted to re build this then they should look to get access slips built to this stretch of motorway and it would probably get enough custom to be a going concern. It does seem a bit strange why the authorities didn't just have the M90 stop as you entered the slip road (and so have the A92 start) since there has been several accidents on the bridge - including a well known incident when a lorry was travelling too fast and nearly flew off the top onto the M90. I'm not sure if that would be allowed, but it would remove the need for "that" sign. The whole junction is a bit odd as it was paid for (in part) by Hyundai who were building a huge plant to the West of the M90 - this has now been mothballed - but the junction provides no access to this site! As for the BP service area - it too fell foul of rules and regulations. It was a good serivce area with a BP Garage, Wimpy, restaurant and shop but because it wasn't actually on the M90 or a junction of the M90 they weren't allowed to advertise the fact there was a good service area just off the motorway. This was despite the fact that the services on the M90 at Kinross and, more bizarrely, the A90 at the Forth Bridge are signposted on the motorway! The junction is now part of a large development - houses and a leisure park to the west south of junction 3 and hotel and office space (and the Halbeath by-pass) to the west north of junction 3. It does make a difference for A92 users wanting to go southbound on the M90 but it's not as if it is a hugely used junction at the best of times. With regards to the M90 / A92 spur. A further piece of contradictory evidence to it being a motorway are the two laybys opposite each other next to the recently re-opened Petrol Station which can be used for parking (as seen in this picture) and just beyond a sign that says end of motorway 1/2 mile. The learner could have been doing Pass Plus... maybe? It involves motorway driving, if there's a motorway around locally (which for an Invernesian such as myself, there ain't).